Sacramento, CA – Today CMTA announces its newest Champion of Manufacturing video, recognizing San Diego-based Solar Turbines Inc., a Caterpillar subsidiary with 4,000 California employees. 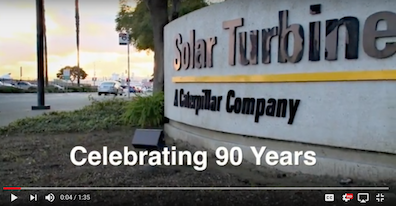 CMTA’s recognition comes at the same time Solar Turbines celebrates its impressive 90th year developing market leading energy products and providing employment, growth and opportunity to hard working Californians. Solar Turbines was joined by State officials this week and a virtual Gov. Jerry Brown by video for the official Anniversary. Solar Turbines’ 4,000 employees design and manufacture industrial gas turbines for onshore and offshore electrical power generation. The company was a perfect fit for the recognition program. "Solar Turbines gives us all the reasons we need to do everything we can to retain and grow manufacturing in the state," concluded Rothrock. "We commend Solar for their commitment to their California operations and CMTA looks forward to the next 90 years." Gov. Jerry Brown helped celebrate with some comments that you can also see in CMTA’s compilation video below.